The Common Field site is a 17 hectare (42 acres) fortified Mississippian town that originally included at least 8 mounds. The largest mound (A) was described in 1914 by David Ives Bushnell Jr. as being oval shaped and measuring approximately 15 feet tall. Adams et al. (1941:10 - 11) numbered the habitation site as village 11 and the eight mounds as numbers 7, 8, 9, 10, 11, 12, 13, and 14. Two published radiocarbon dates from the site are AD 1210 +/- 70 (Beta-4998) and AD 1440 +/- 60 (Beta-4997); both samples were from house features tested by Michael O'Brien from the University of Missouri - Columbia (Ferguson 1992:3). 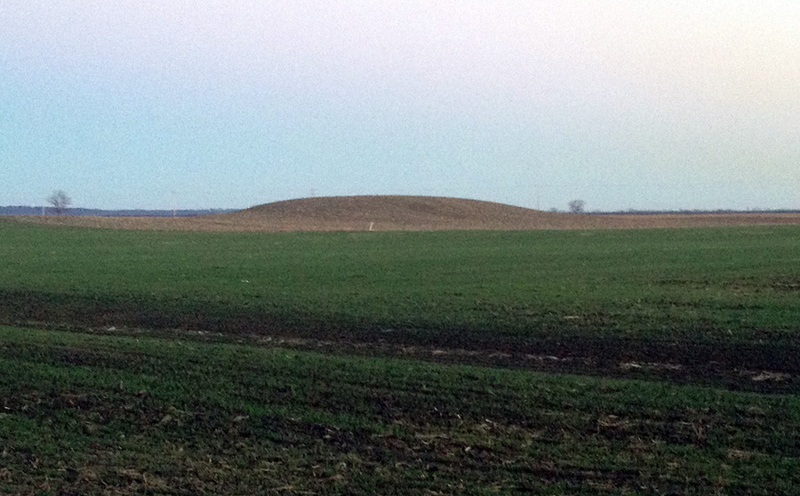 Photograph taken near dusk of Mound A at the Common Field site, 22 December 2013. 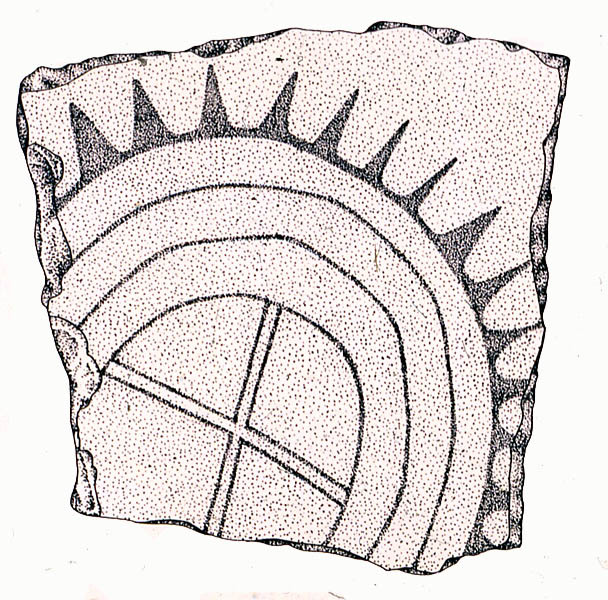 Drawing of a negative-painted body sherd with black-on-dark red sunburst and central cross motif; specimen 990 illustrated by by Jacqueline Ferguson (1990:Figure 21). 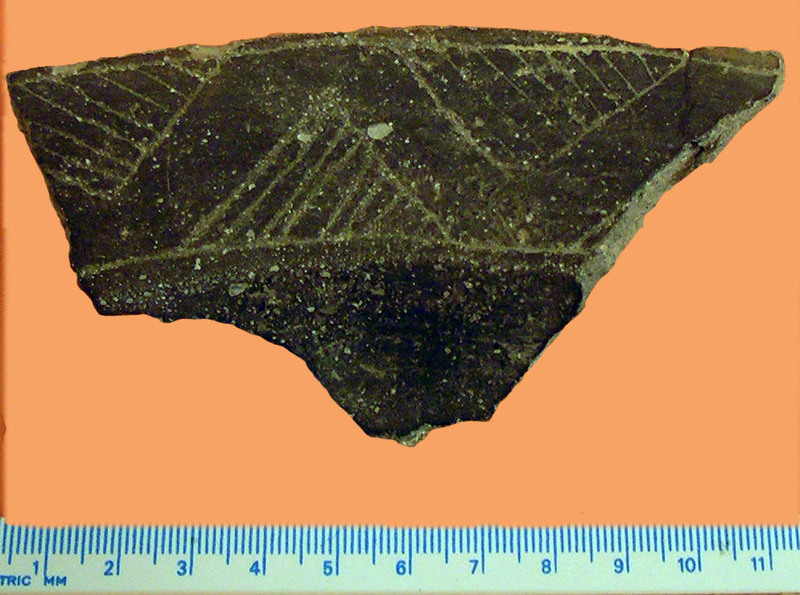 Photograph of the negative-painted sherd, speciment 990. 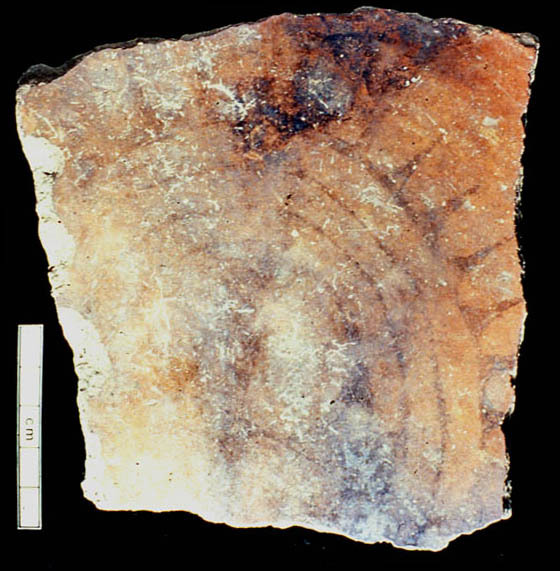 Decorated shell tempered pottery sherds from 23SG100. Upper left = untyped ware with appliqued decoration (specimen 575-2). 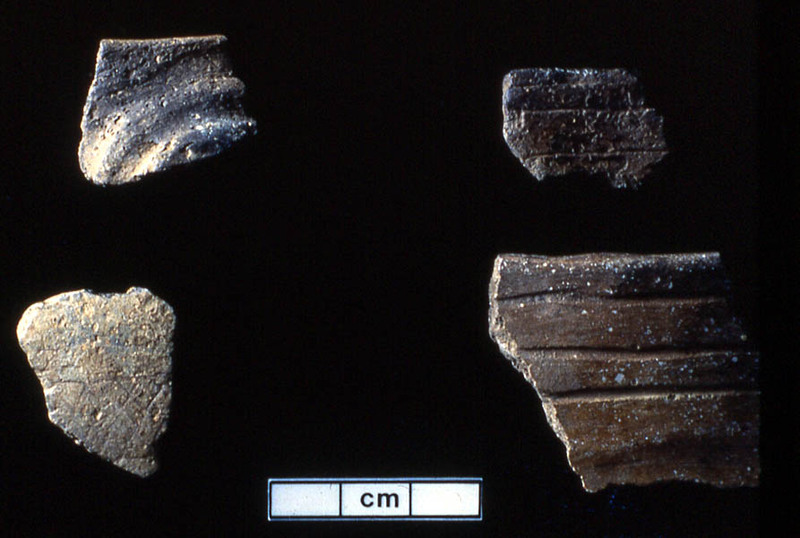 Upper right = Coles Creek Incised bowl rim (specimen 1072-1). 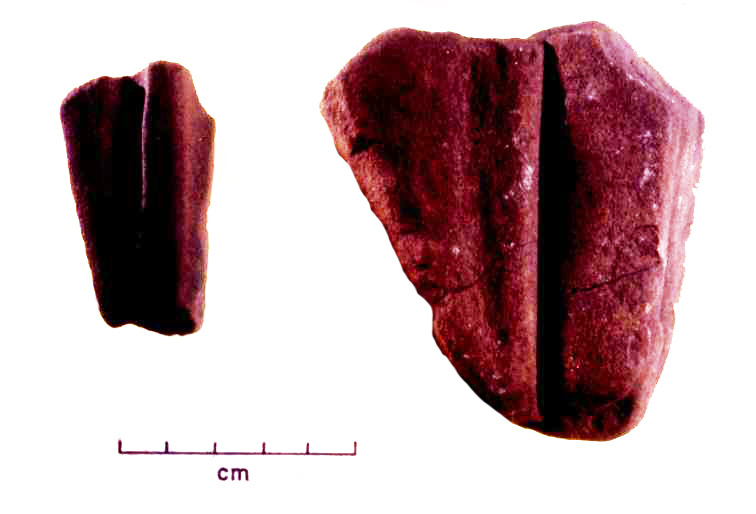 Lower left = Maddox Engraved bodysherd (specimen 1119-1). 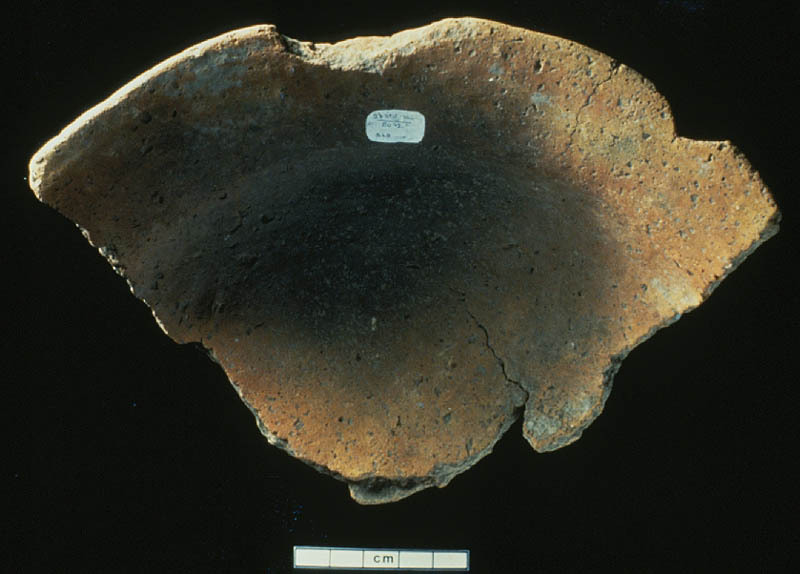 Lower right = Mound Place Incised bowl rim (specimen 969-1). Identifications by Ferguson (1990: Figures 18a, 18b, 18d and 22b). Two sandstone abraders from the Common Field Site; digitized image from a slide taken by Patrick Trader. Crips Ovate, Madison, Scallorn and Reed points from the Common Field Site; digitized image from a slide taken by Patrick Trader. 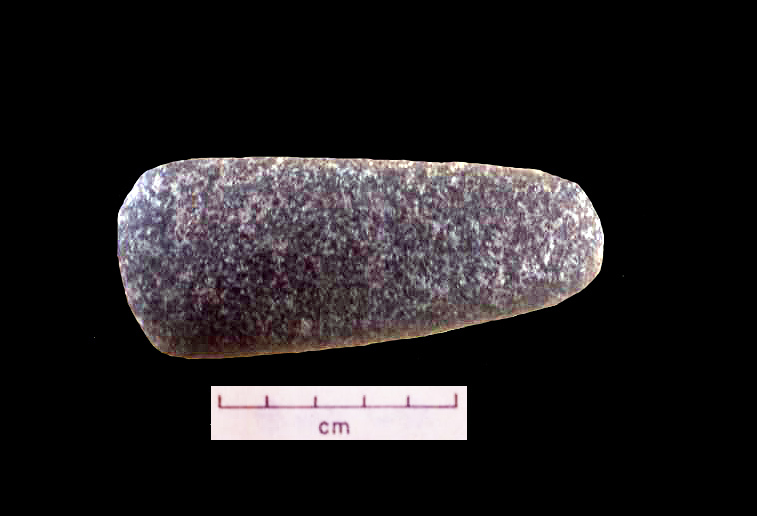 Diabase celt from the Common Field Site; digitized image from a slide taken by Patrick Trader. The Common Field Site was placed on the National Register of Historic Places during 1969. The site is on private property and is not open to artifact collectors or visitors. 1941 Archaeological Survey Survey of Ste. Genevieve County, MO. 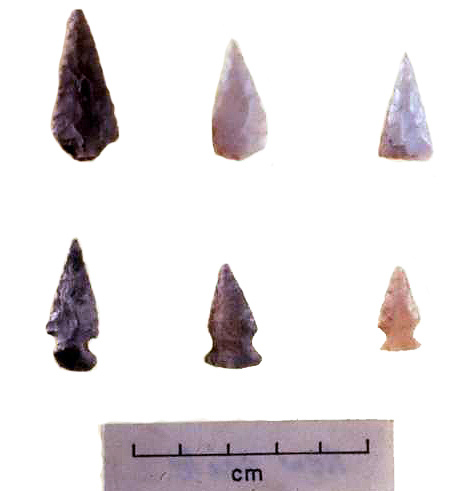 Missouri Archaeologist 7(1):9 - 23. 1914 Archaeological Investigations in Ste. Genevieve County, Missouri. Proceedings of the United State Museum, Smithsonian Institution 46:641 - 668. 1990 Pottery classification, site patterns and Mississippian Interaction at the Common Field Site (23SG100), Eastern Missouri. Unpublished M. A. thesis. Department of Anthropology, University of Missouri, Columbia. 1992 Pre-Columbia Pottery: Form, Function and Symbol. The Living Museum 54(1):3-6.